We were recently featured in an article, "Calypso Kayaking Leaves a Legacy in the Lagoon". My business is mobile, I do not have a store. Please call to reserve a tour or rental. Looking for things to do in the Orlando and Cocoa Beach attractions area? Look no further. Calypso Kayaking invites you to slip away on an unforgettable kayaking tour & adventure. Located minutes from the Cocoa Beach resorts, we offer guided kayak tours in the local waters of the Cocoa Beach area. 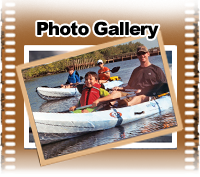 We are experienced with the best routes for kayaking in the Indian River Lagoon waterway. We offer daily morning, afternoon & sunset tours and Bio luminescent tours. Just a short drive from Cocoa Beach, Orlando, Melbourne, and Daytona Beach Florida, the Indian River Lagoon offers a diverse ecosystem that is one of the hidden natural wonders of central Florida, and is often overlooked by visitors to Cocoa Beach, Daytona, and the Orlando attractions. There may be plenty of things to do in the Orlando and Cocoa area, but none match the experience of a Calypso Kayaking tour. Calypso Kayaking offers a unique blend of peace and relaxation combined with thrills and adventure that’s unmatched by other Orlando and Cocoa Beach attractions. Imagine the peace and beauty of a day on the sands of Cocoa Beach combined with the excitement of your favorite Orlando theme park ride, and you have some idea of the unique experience offered by a Calypso Kayaking tour. This Cocoa Beach Attraction is rated excellent by travelers. If you enjoy kayaking in Melbourne, Fl., kayaking in Orlando Fl. or kayaking in Daytona Beach, Fl., this kayaking eco-tour is less than a one hour drive. There are no lines and no crowds on these kayak tours. From beginning to end you’ll be surrounded by the natural beauty of mangrove covered shorelines and the peace and tranquility of the Indian River Lagoon. But don’t be fooled, plenty of thrills and adventure await you on this relaxing kayak tour. 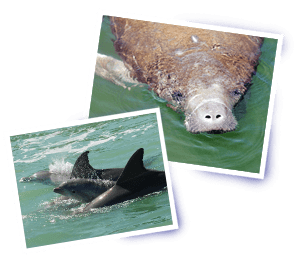 The inter-coastal waters surrounding Cocoa Beach and Merritt Island are filled with an abundance of wildlife, and a close encounter with a bottlenosed dolphin (think Flipper) while on one of our kayak tours will definitely give you some thrills to remember. But that’s just the beginning of the adventure that awaits. While Orlando is the land of princesses and fairy tales, the waters surrounding Cocoa Beach and Merritt Island is the land of giants. Real giants! The huge Florida Manatee calls these waters home. While these creatures are a threatened species, they can be found in abundance here in central Florida. They are docile and curious creatures that can reach over 13 ft. in length and weigh over 1 1/2 tons! With no natural enemies they find our kayaks a curiosity and will often approach to within just a few feet to investigate who’s sharing the waters with them. While they are completely harmless, the thrill of a close encounter with such a rare and large creature is a thrill you won’t soon forget! So join us as we navigate through the river’s waterways and experience an immediate activation of the senses. The sights and sounds of nature, and the excitement of your family and friends, create an experience we call an “Unforgettable Kayaking Adventure”. We also offer kayak tours on the tranquil moonlit waters of the lagoon. This is a night time excursion where we can look for bioluminescence and comb jelly fish during certain times of the year, or just take a relaxing night tor with an experienced local guide. It’s quite a memorable experience! We also offer a great tour experience on stand up paddle boards. Get an entirely new perspective of the Indian River Lagoon and other treasures around the Cocoa Beach area in Merritt Island. Just a short drive from Orlando, Florida, Calypso paddle board tours offer an exciting and personal experience that is sure to be one of the top highlights of your central Florida trip. 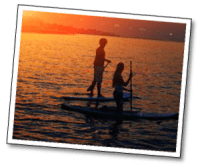 A Stand Up Paddle Board (SUP) tour is an amazing adventure that creates great long lasting memories.Our tours are setup to easily service visitors to the Orlando, Daytona Beach, Cocoa Beach, Melbourne, Indian River Lagoon, and Merritt Island areas. Experience a daytime paddle journey a sunset tour, or a bioluminescent tour that is sure to add real value to your Florida vacation. We also offer Paddleboard (SUP) rentals for visitors looking for a great DIY experience on Florida’s east coast. Cost effective and self paced exploration of this amazing area. Few visitors to the Orlando and Cocoa Beach area are aware of the fact that the Indian River Lagoon is home to a truly unique and magical natural phenomena. The nighttime waters glow! During the summer months on the Indian and Banana Rivers every movement in the water produces light! It’s a great time of year for an sunset/evening kayak tour. 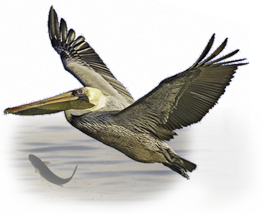 The movement of your paddle or a school of fish leaves a blue-green trail. The movement of manatees and stingrays leave a slow moving glow. Every movement in the water produces light! The waters of the Indian River Lagoon come alive after sunset and puts on a show you never soon forget. Experience this phenomena while on your visit to Florida with a sunset/bioluminescent kayak tour on the Indian River Lagoon! If you’re looking for things to do in Cocoa Beach and Orlando, I invite you to try and unique and unforgettable experience. Slip away with me on my next unforgettable kayaking tour and adventure. Bioluminescent kayak tours begin in late May or early June and last through the summer months. This tour launches at 9:00 pm & 11:00 pm, when the magic begins with a light show that is something you have to see. This is my favorite tour of the year. Everyone on these tours walks away with the best experience. Unfortunately, the full moon significantly reduces the visibility of the bioluminescence, so for a few days before and after each full moon we shut down our bioluminescence trips. Instead, we offer kayak tours on the tranquil moonlit waters of the lagoon. It’s quite a memorable experience! We also offer private and small group tours. When you sign up for a private tour, you’re guaranteed to only be accompanied by your guide and your friends/family. Please call if you would like to schedule a private tour. 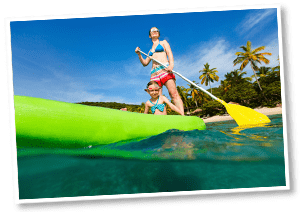 If you’re the “do-it-yourself” type, or would prefer to experience your kayaking adventure in a private setting with only your small group of friends and family, then private kayak rentals are for you. We offer private kayak rentals for groups of up to 4 people. For an affordable hourly rate you can build your own custom kayak adventure. 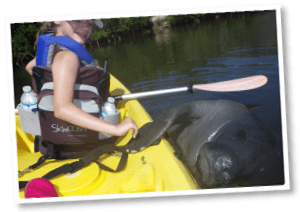 If you choose to depart from Manatee Cove (where our guided tours begin), your kayaks will be waiting in the water and ready to go at the time of your choosing. You can just hop on board and begin your self guided tour. If you would rather depart from another location, you can arrange to pick up your kayaks at Calypso Kayaking’s kayak storage center (located near Manatee Cove). We’ll mount the kayaks onto the roof of your car using kayak mounts suited for almost any vehicle. Just return the kayaks to the storage center at the end of your trip. If close encounters with an incredible array of marine wildlife isn’t enough excitement for you, how about adding in the fun and excitement of a SUP board!! New for 2015, we now offer private SUP board rentals. Talk about being close to the water! It’s just another fun and exciting way to enjoy your day, but be warned, you should definitely be prepared to get a bit wet. These boards are very stable and easy to paddle so you don’t need a lot of skill to use one. However they are easier than a kayak to fall off. • and many other species of wildlife! 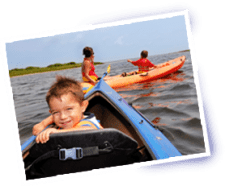 Whether you already enjoy Kayaking in Orlando, FL or even kayaking in Melbourne, FL, you have not experienced true Florida kayaking until you have enjoyed a trip with Calypso Kayaking. Book your tour today!